Employment | KUMSHEEN | Raft. Relax. Recharge. We’re very fussy. Kumsheen employees have that something extra that makes them reliable, knowledgeable, loyal, friendly, fun people to be with—and they’re prepared to work hard. That said, if you or someone you know has the right stuff to join our great team, check out the positions we have available this season. Please review the job opportunities listed below. Employment duration generally begins early May until Labour Day weekend. Complete the employment questionnaire, or email a cover letter and resume to employment@kumsheen.com. We are now accepting applications for summer employment at Kumsheen for a number of positions. 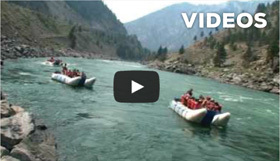 Presently we have available trip leader and raft guide positions. Our criteria for selecting guides is based as much on personality, amiability, and people skills as on whitewater skills and experience. We are always looking for bright, honest, conscientious, amiable, guides to work both full time and part-time. 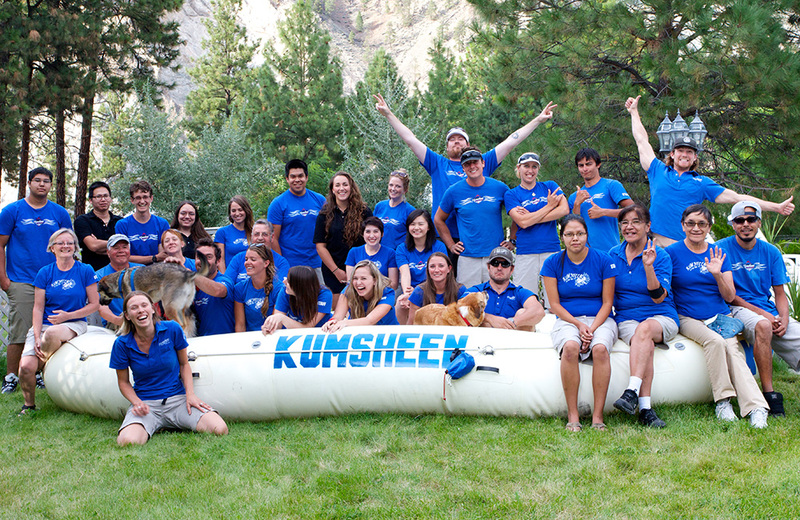 If you’ve worked as a guide in BC or elsewhere, and you feel you have what it takes to become a Kumsheen Guide or Trip Leader, let us know by filling out the employment questionnaire or send an email to employment@kumsheen.com. 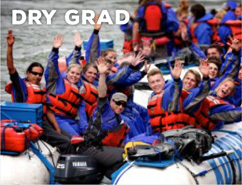 We require that all of our new river guides participate in our Raft Guide Training School so we can better get to know you and evaluate your skills. It’s important to us that we hire team players and the guide school allows us to choose the best team possible. 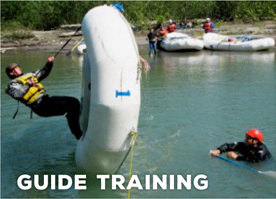 If you are interested in guiding for us but have little or no rafting experience, our Raft Guide Training School is the perfect way to learn about guiding. We select students from our Guide School and invite them to continue training on motorized rafts for an additional 12 day period (we do not charge anything for this additional training). When our senior staff feels that you are technically skilled enough to run the river with guests, and represent Kumsheen’s standards, goals, and philosophies, you’ll be able to start work as a member of the Kumsheen team. The time it takes to train varies among individuals. 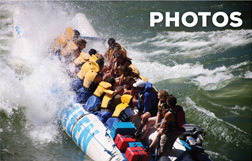 Our rafting season commences May 1st and finishes at the end of September. A person successfully executing the responsibilities of this position will perform the following major activities: open the office, greet and check-in guests, process invoices and receipts, sell items in the retail shop, take and process phone, internet and mail inquiries, keep trip files current, mail out information, complete daily cash reconciliation, and close the office. 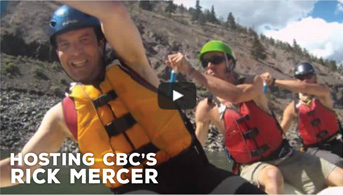 The office staff is responsible for the accurate processing of guests’ reservations for raft trips, camping, restaurant and resort packages, as well as maintaining a friendly, efficient, well-organized office. To perform well, the person in this position must have the following skills and characteristics: have customer service skills, office procedure knowledge, telephone sales skills, and an ability to work well under pressure; be hardworking, dedicated, well organized, friendly and cheerful. This individual will assist the Head Chef in all kitchen operations, consistently producing food in keeping with resort standards, while maintaining kitchen hygiene values and adhering to Health & Safety guidelines of the BC Food Safe Program. Servers are not only providers of food but are also ambassadors, salespersons, and representatives of Kumsheen as a whole. Guest experiences are strongly influenced by the service they receive in the restaurant. The successful candidate should possess a pleasant, calm and friendly manner; have a good memory; display initiative; exhibit innovation, creativity, and flexibility; and have a winning attitude. Solid experience with good references and a “Serving it Right” (or the equivalent) certificate is required. The Kumsheen Restaurant seats 60 indoors and has an outside patio that seats 70. In the summer it is a full-service restaurant catering primarily to resort guests and secondarily to the general public. It is open for breakfast and dinner with an a la carte menu. The Head Working Chef is responsible for all aspects of the food-service operation, including the administrative and technical duties required to provide the restaurant with high-quality cuisine. The Chef’s responsibilities include supervising, training, and monitoring the duties of all other kitchen personnel, purchasing, food-cost calculation, and the accounting necessary to run a quality food-service operation. This is a Chef position which has a lot of interactions with other staff and positive communication skills, leading by example, and patience are requirements for the job. The position of Campground Attendant requires someone who is friendly, outgoing, a self-motivator, organized, likes working outside and meeting new people. 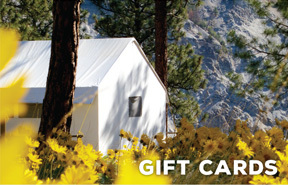 The Campground Attendant is someone who is not only responsible for keeping the campground orderly and clean for all of our guests, but they are also an ambassador, salesperson, and representatives of Kumsheen as a whole. 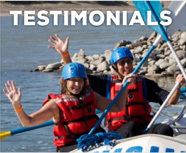 Guest experiences are strongly influenced by the service they receive from our exceptional staff, and the campground attendant is quite often the first staff-member our guests meet. The successful candidate should be a hard worker, possess a pleasant, calm and friendly manner; display initiative; exhibit innovation, creativity, and flexibility; and have a winning attitude. In May and June, the photographer works part-time to take photos of some of the larger groups we have, usually around 10-15 days per month. In July and August, the photographer would generally work 5 days per week, with their days off covered by another staff member. This individual will have some photography experience and be comfortable working with and on computers. They must also be a quick worker to ensure the videos are edited and posted before the trips return, and be good at working on their own. The photographer must ensure an organized work-area and make sure that the trip photos are mailed out daily, and occasionally will work on other marketing-style photos for Kumsheen. The individual will also be physically fit, as it is a physically demanding job and have a valid drivers license. This individual will be great at working individually to put out high-quality trip videos with a splash of humor. The Videographer must also “Speed-Edit” the 15-20 minute video in approximately 20 minutes, so familiarity with Final Cut (we use the Express version) is mandatory. The Videographer will also ensure an organized work-area and make sure that the trip videos are mailed out daily, and occasionally will work on other marketing-style videos for Kumsheen. The individual will also be physically fit, as it is a very physically demanding job while filming. If you think you’d be a great Kumsheen Team Member, we’d be delighted to hear from you. We’re always looking for interesting, talented people we feel would make the Kumsheen experience even more memorable for our guests. Click here to complete the employment questionnaire, or email a cover letter and resume to employment@kumsheen.com.